Metal Hooks to hold the tunnel onto ground. Overall unit length of 5.25m, 60cm diameter. Lightweight, with the carrying bag, easy to take with. Made of high quqlity Oxford polyester that resists tearing. Sturdy and durable, during various training will not be destroied. Benefit for getting your pets regular exercise and retaining youthful vigor. 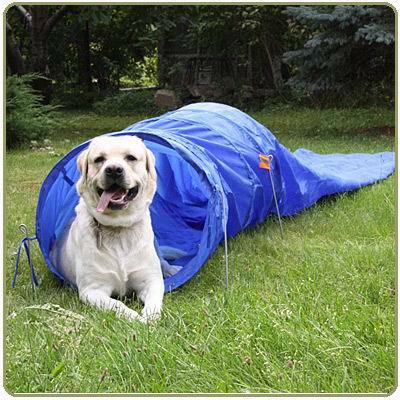 Investing in good quality agility equipment ensures that the dog is safe during training sessions. So you don’t need to go to agility classes weekly, therefore can save lots of money in the long term. Having agility equipment provides regular exercise and stimulation, helping humans to bond with their four-legged friends.